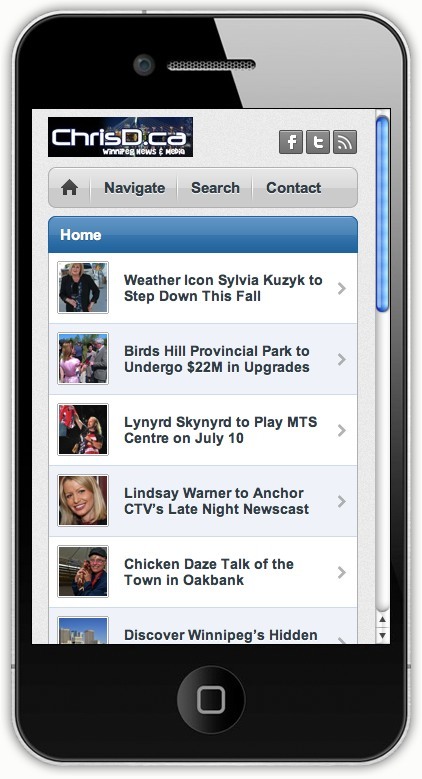 Type ChrisD.ca into your mobile browser. Your smartphone will automatically bring up the mobile version of our website. Today ChrisD.ca officially launched a revamped version of our mobile website for iPhone, BlackBerry, Android and Windows smartphone users. Previously, only an iPhone-friendly version was available, but we’re now happy to extend our content to a wider range of devices. The new layout is streamlined to provide the day’s stories in an organized fashion, and allows readers to comment directly on a story just like they would on our website. There’s a handy contact form for providing feedback or submitting news tips, access to navigate the other sections of our site, and the ability to search our archives for past articles. At the top right of the page, you’ll find buttons to connect with us on Facebook, Twitter and browse our RSS feed. There may be the odd bug here and there we’ll have to work through, so please help us improve by reporting any issues.